If you want a pre-built, you should aim for this monster. If you're in the market for a great pre-built gaming PC, here's a tempting offer for you. Right now Amazon is selling a CyberpowerPC Gamer Extreme with an RTX 2080, an i7-9700K, 16GB of RAM and 240GB SSD/1TB HDD for a very reasonable $1599, saving you $170 off the list price. 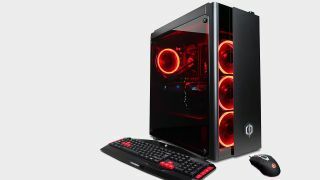 Frankly, we think you'd struggle to build a PC this powerful yourself, especially as it comes with liquid cooling, Windows 10 installed, and a cheap and cheerful keyboard and mouse. That's a hell of a lot of kit for $1600. It's uncertain what make and model of GPU or SSD is included in the PC, as Cyberpower says that it 'may vary with what was available at time of assembly'. Usually, you tend to get ASUS and MSI graphics cards with CyberpowerPC builds. We do know that the RAM speed is 2400Mhz as standard, and that it comes with an 800W PSU. There are 4x slots on the Z370 motherboard for SSD or HDD combinations, and it does have M.2 slots if you plan to upgrade to NVMe drives. You should be able to upgrade the RAM too, although if this is an issue make sure you check in with CyberpowerPC first; they're very good at answering questions in the Amazon product listing. For us, this is a great PC with a whole lot of power per $. If you're looking for an easy system that comes 4K and VR-ready, you'll struggle to find a better deal than this until maybe Black Friday in November.